Alongside the Battlefield V Tides of War Chapter 1 release tomorrow on the 4th of December, DICE will bring an update towards Battlefield V. A new patch 'should' be good news for GeForce RTX owners as the patch would bring an up-to 50% performance increase on DX-R (Raytracing). 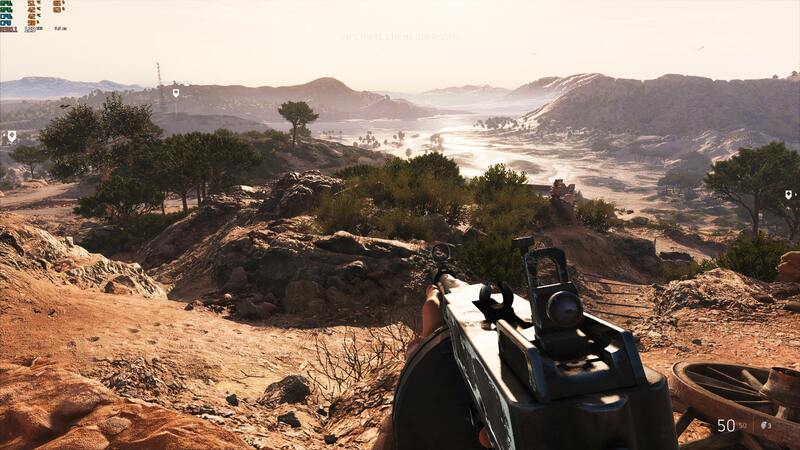 If all is true it could enable gamers to play "Battlefield V" with DXR enabled at a1440p resolution while gaming with 60 fps averages. The DXR preset would be with the Ultra setting as a video explains. With a GeForce RTX 2070 or 2080, you would be able to play 2560x1440 at 60 FPS averages on the DXR medium setting. NVIDIA mentions specifically that it is continuing to work with DICE to improve DXR performance even more. Nice! Waiting for DX 12 sli too, so I can benefit my 2x 2080ti in DX12, and not just DX 11. Hello. i also do have 2 RTX2080tis but sli doesnt work for me in BFV i get 40 fps with 2 cards .....totally broken please help me get the, working ! It is not supported, and whether it ever will be is up in the air. The only public comment that has been made is 'we are working on it' and there is no way of knowing whether that means DX11, DX12 or both. 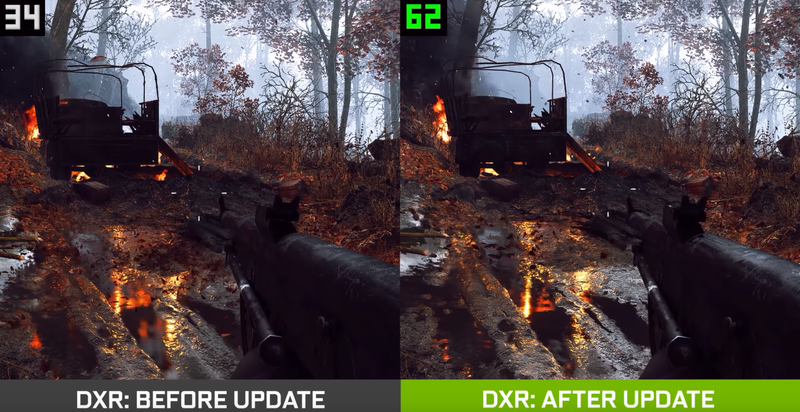 Keep in mind that they never bothered to implement SLI in DX12 for either BF1 or Battlefront 2. DXR, they'll add DXR support to their hardware. RTX is nVidia's implementation of DXR. Who is expecting some downgrades? I've never known a time when nVidia hasn't "downgraded" its image quality to wring out more frame rates. nVidia is a frame-rate benchmark-oriented company, where image quality has always come in 2nd-place (whereas ATI, now AMD, puts the emphasis on Image Quality). What they'll be doing is less "real time ray tracing" *cough*, such as it is, to move the frame-rates up. Look at that nVidia frame on the news page--nothing in it is being "ray traced"--but to make it appear differently--nVidia has darkened the face of the building in the "RTX off" frame so that in the "RTX on" frame the building face appears much brighter! It's so phony it sets my teeth on edge...Grrrr. Sure. Let's cut the Raytracing around half in games, just because it's too much for any present graphics card to handle it (2080 Ti included) and let's get that same amount of performance gain. Raaytracing is very nice evolution of graphics from Nvidia, unfortunately the graphic cards today are not ready for it, maybe only up to 1080p gaming! It's still miles better than rasterization with tones of fake cube maps lighting. On the left side you can actually see fire rendered in front of the vehicle, where it shouldn't be visible. It's not downgrade. It's a bugfix. I don't have the game, but is that scene 100% scripted and an apples to apples comparisons? I used to be against downgrades as i didn't care that i could only run the game at 720/10 as that would not be the case in the future, but after years of people whining about performance and optimisation i have been beaten into submission by those happy with mediocrity. AFAIK they aren't doing any additional culling of rays aside from what's already in. They talk about culling in that article but that's already part of the quality slider. But yeah - if they are doing additional culling it's downgrading. Personally I don't care if they downgrade the reflections as long as it's truly reflecting the scene and is relatively unnoticeable. I mean the game has particle leaves spawning out of random terrain that if you stop and look at it, it's terrible looking - but in motion, jumping around and blowing people up with random leaves everywhere - it pretty looks cool. Same thing for reflections - I don't care if I pause a video and notice like some previous reflection looks slightly worse as long as the plane crashing through the air down on my head is rendered in the puddle complete with fire and smoke. All amd would need to do is bring their real time ray tracing from pro line to gaming line. But alas it would make little sense at the moment as Nvidia proved doing only reflections is really taxing now bring shadows and GI and we are in even worse situation. Was expecting some shady practices like reducing the quality. Lets wait and see. AMD's realtime raytracing is not "realtime"
BF5 in DX11 works out of the box just fine for me. 0:34 I don't see much difference in the reflections, but i see less of leaves and they are bigger. Sorry, but neither of those images is raytraced. Both use cube map reflections. It is painfully obvious. In video at time of those images is more interesting anomaly. Before patch, physics particle generator for leaves (horrible btw.) puked many more leaves, like 3 times as many. As for raytracing, on 1:17: between vehicles and barrels there are some vertical structures which are leaning bit to the left. But reflection has them leaning to the right. Scene right after it (1:19) has red building at left. There is an tree on left side in front of building., almost as tall as building itself... guess what is not visible in raytraced reflection. Scene at 2:29 with tank has 4 lights from car visible. Once tank moves in front of car, one of headlights is still reflected. In scene after (2:32) with 2 tanks in lake, they are partially ignored by raytracing. Traditional screen space reflections are unable to display objects which were not rendered (not on screen or covered by other geometry). Raytracing on other hand can ignore something right in center of the screen.